Alicia Keys Play At The Park With Her Family! Home » Alicia Keys Plays At The Park With Her Family! 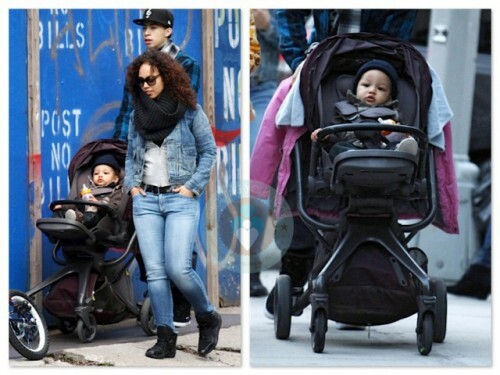 Alicia Keys was spotted on her way to the playground in SOHO with her son Egypt and step-son, Prince Nasir this afternoon. The singer was casually stylish in denim jacket, matching jeans and a cableknit sweater. 14 month-old Egypt was pushed by a friend as he chilled out in his Mamas&Papas Mylo stroller. When the family got to the park the tot played on the swings and in a red ride-on car. On the way home Alicia helped carry a friend’s bike while Prince rode along on a Rockboard scooter.